This Pattern Had Several Uses In Ancient Asia Which Included Divination, Map Making, Urban Planning Property Division and Apparently Chinese Games. I am dedicating these particular chessboard type grid geoglyphs and all the other similar ancient grids in Oregon to Joseph De Guignes. A French orientalist and sinologist (October 19, 1721 – March 19, 1800) he was the first western scholar to write on the theory of pre Columbian Chinese exploration and colonization in North and South America. For approximately 75 years his views on this topic were accepted as fact. However, during the 19th century and early 20th century objections were raised to his thesis and vigorously debated. As the result of this debate modern academia has largely rejected his research. However, there are many who continue to believe his work and the new evidence that bears witness to the accuracy of his bold assertions made in 1761. Although De Guignes was the first western scholar to theorize on the early Chinese contact and influence in North America numerous others have followed in his footsteps. Nonetheless De Guignes is the reknown western scholar who wrote about it first. Joseph Needham has written extensively on the use of the grid in ancient China. These uses may have begun with the Yi (Shi) practice of divination but eventually spread to astronomy, navigation, map making, urban planning, property division and Chinese games such as Chess and Dominoes. Perhaps then you can understand my wonder when I began to notice huge quantitative grid patterns, geoglyphs and altered lakes from satellite photographs appearing in the western United States and Canada. It was one thing for Julius Heinrich Klaproth to declare that Hwui Shan was a liar because as far as Klaproth knew there was no way that China had the technology or navigational knowledge and skills to make that trip. However, we can now access research that shows that opinion incorrect because of the astronomy, map making and navigational skills of Zhang Heng and Phi Hsiu of the 1st and 3rd centuries as well as Admiral Zheng He in the 15th century. We now know the Chinese were predicting solar eclipses two thousand years before Christ and had a far more extensive map of the solar system than Ptolemy and the Greeks ever had. But all Klaproth’s and the others who held similar viewpoints bold inaccurate statements were made well before we put satellites into orbit that regularly send us back pictures of our earth-warts and all. From those photos we can see images of earth that were never visible from the ground. Satellite photographs are providing us with images of earth from the stratosphere. In these images we can see “black water” lakes and geoglyphs that have been shaped to resemble objects that we can now recognize as well as the chessboard and domino grid symbols which are the subject of our latest discussions. Who could have created these symbols and why would they have done it? The consensus is that although the origins of what the world knows as modern chess originated in India the ancient origin of the chessboard grid itself which evolved over time into the modern chessboard had its roots in shamanistic China. It started in a “game” called Shi (Yi) originated by the ancient Chinese. This was used for divination (fortune telling). As time elapsed it morphed into the popular Asian game of Go (Weiqi) which is played worldwide by avid devotees. There are scholars that say to understand even modern as well as ancient Asian concepts of conflict that one must understand the principles of “The Surround Game” –Weiqi. Likewise the game of dominoes originated in China in the 12th Century if not even earlier. From China it spread to the rest of the world. 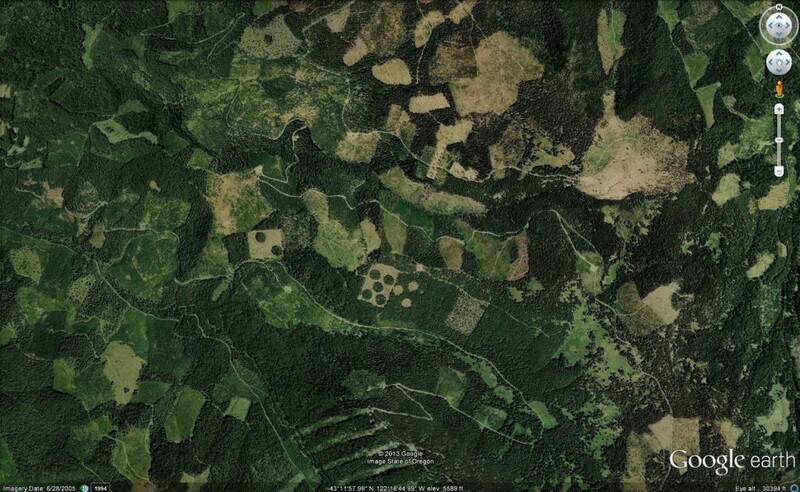 For views of domino pattern grid geoglyphs in Oregon ‘Google Map’, “Diamond Lake, Oregon”. When you arrive at the lake scroll left (west). Shortly you will see a five (5) and a two (2) domino pattern grid. 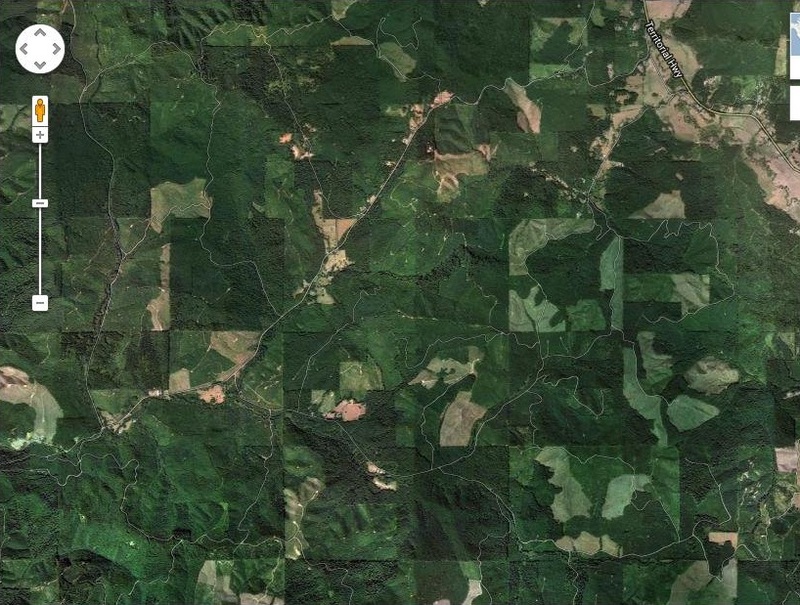 Immediately above those two is a one (1) domino pattern but although the one “dot” (circular stand of trees) is clearly visible the “tile” grid has seriously degraded over time. Who would have known of dominoes in pre Columbian America? Recently I have been finding what appears to be ancient grid patterns across western North America. To see some of them Google: “The Joseph Needham Chessboard Grid Collection”, “The John Fairbairn Ancient Go Board” and “The Homer Dubs Chessboard Grid”. However, the most impressive collection of these grids are found in Oregon near the Pacific Coast. These grids like the others were created by deforestation. Oregon’s two tone rectangular grid formations are the largest by far and go on and on for miles. Even though some of the lines have degraded over the passage of what I believe are hundreds of years you can tell the same lines were there at some point because the lines that are interrupted appear again both above and below or are still apparent on both sides of interrupted lines that have degraded away over time. These can ONLY be seen from altitude. Therefore you must use either Bing Maps, Google Maps or Google Earth to see the Oregon grids and the other North American grids. Use any of those searches and type in “Fern Ridge Reservoir”. When you get there scroll south and stay at either 1 or 2 miles per the left hand bottom legend. Later scroll around the whole area. This cannot be random. But what was the major mission here—harvesting the lumber or creating those grids that still exist today as a “Bird’s Eye View Grid Map”?Who would have gone to such lengths to harvest lumber in such remote locations with forest stands that still connect today at the diagonal points of the grids? That would be a lot of wasted effort if the goal was simply to harvest lumber. Ancient China was deforested because of its population’s consumption of wood products but over thousands of years still maintained its demands for charcoal and lumber nevertheless. During the Ming Dynasty Chinese Admiral Zheng He had the world’s largest fleet of wooden ships in history. Is it possible that it was pre Columbian Chinese that harvested the lumber and created that huge chessboard grid system in Oregon, Washington and the other grid locations in the western USA that you can still see today? Was it because they needed the lumber for building materials and fuel like they are extracting from the forests of Tibet even today? If this is true what happened to the Asian people here? In 1433 the Ming Emperor of China began the 500 years of “China’s Sorrows” by issuing a degree of isolation for all of China and her people. China’s involvement internationally was drastically reduced and overseas Chinese in large part returned home while Chinese maps and technology slipped away to other cultures. As additional European explorers and colonists arrived in North and South America in the late 16th and early 17th centuries they met far less resistance than one might expect. That was because the earliest explorers and colonists brought diseases to North America that the indigenous population here had no immunities against and no knowledge of how to stop or slow down. By the time this pandemic was over approximately 80 to 90% of the original Native American population had perished from this combination of diseases. Putting this catastrophe for the locals another way the population went from 32 million to less than (approximately) 5 million across the continent. For those that find this hard to believe this account is borne out by the Spanish explorers and Catholic priests who retraced the steps of the first Spanish explorations traveled 100 to 150 years earlier. In numerous cases where the original explorers had found and recorded finding large settlements with sizable populations the new explorers found only ruins of buildings and bones. When it is fully understood the story of the 16th century North American indigenous pandemic may be ultimately recorded as the most deadly in human history. Given the extent of the losses in the Native American population might it be safe to say that most likely a large amount of their previous technology and culture was lost at the same time as the human lives. The question remains-Who is responsible for these enormous grid geoglyphs in North America visible only from the sky? 4) One generation passeth away, and another generation cometh – but the earth abideth forever. 9) The thing that hath been; it is that which shall be; and that which is done is that which shall be done: and there is no new thing under the sun. 10) Is there anything where of it may be said, see, this is new? If hath been already of old time, which was before us. 11) There is no remembrance of former things neither shall there be any remembrance of things that are to come with those that shall come after. The Beak of the Tenth Sun/Raven-STILL GLOWS!